Welcome to Industrial Optics Unlimited – Big enough to get the job done yet small enough to care! 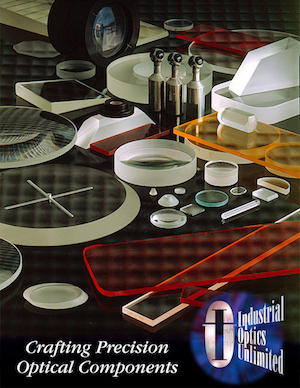 Industrial Optics Unlimited has been fabricating precision optical components for use in a wide range of technical applications since 1990. Everyone at Industrial Optics is committed to your overall satisfaction by providing you with high quality, American Made optical components, competitive pricing, flexible deliveries and exceptional customer service. By gaining your trust and confidence we hope to build a long lasting partnership by becoming your optical supplier of choice for all of your commercial and precision optical needs. Industrial Optics welcomes both small and large companies and is equipped to handle your requirements from small/prototype runs to production quantities. From plano optics to spherical lenses, Industrial Optics is ready to meet your commercial and precision needs. We are committed to improving our processes to better serve the needs of our customers. Industrial Optics can support your custom requirements at a competitive savings to standard catalog pricing while providing great quality and exceptional customer service.